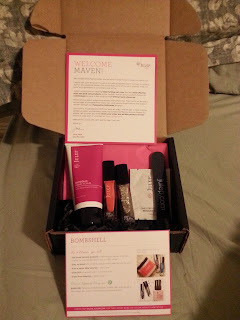 I came across a Julep video on the internet advertising a FREE Julep Maven starter box, so I signed up!! I love free stuff!! I took their style quiz and got Bombshell. I added on a few extra items to my order to qualify for free shipping, but I hear it's about $3.99 for shipping if you just sign up for the box and not buy any add-ons (but still $4 isn't bad since the box is suppose to contain at least $40 worth of goods!!). I was excited to try the beauty item which was to be included, but didn't automatically love the colors shown in my selected box. However, I wanted to keep an open mind and try out what was picked for me especially since I didn't already have colors like them in my current collection. I loved the Glycolic Hand Scrub-it smelled amazing and made my hands so soft!! I used it before doing my manicure. A single polish remover pad and nail file made nice little additions to the box's contents. I'm still not totally in love with these colors on their own, but I do think they go well together in this nail art. 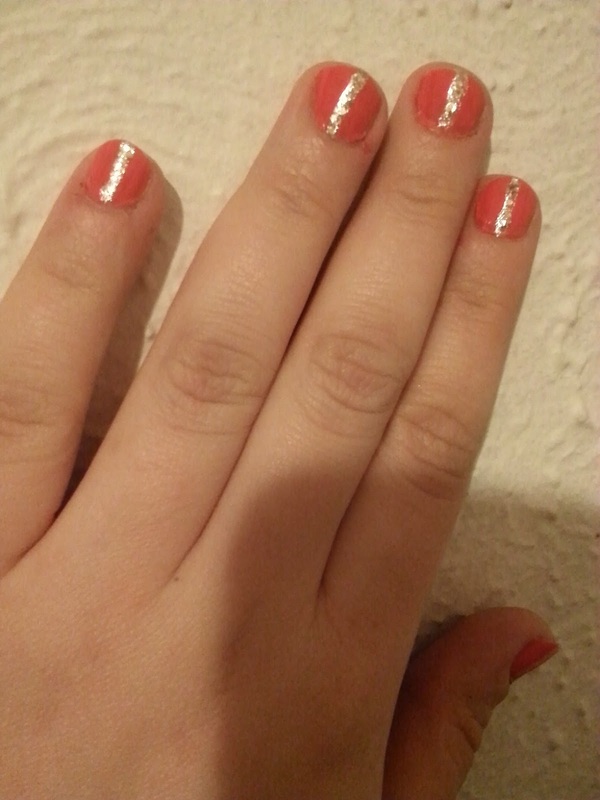 I received a compliment on them and it was nice to try something new. I love the Acetone-Free Conditioning Nail Polish Remover-it's easy to use and reminds me of the ones they use in the salons! The Quick Dry Polish Drops and Freedom Polymer Top Coat both dry nails quickly. 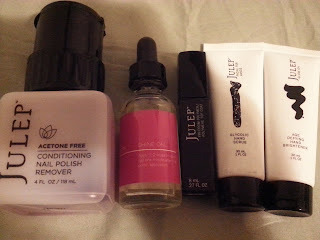 I haven't tried out the Glow On Age Defying Hand Brightener or Facial for Hands yet, but will review them when I do. If you sign up to be a Julep Maven, you will be presented with a box based on your answers to their style quiz. If you love the contents of the box, you can choose to buy the box. If you don't like what's inside you can choose to purchase another box offered (there are 5 different boxes offered every month). If you don't like any of the boxes presented you have the option to skip that month and will not be charged anything. You will be charged a $19.99 monthly fee unless you cancel your subscription or skip the month. Each of the polishes retail for $14 and each box is supposed to include product worth $40 or more. 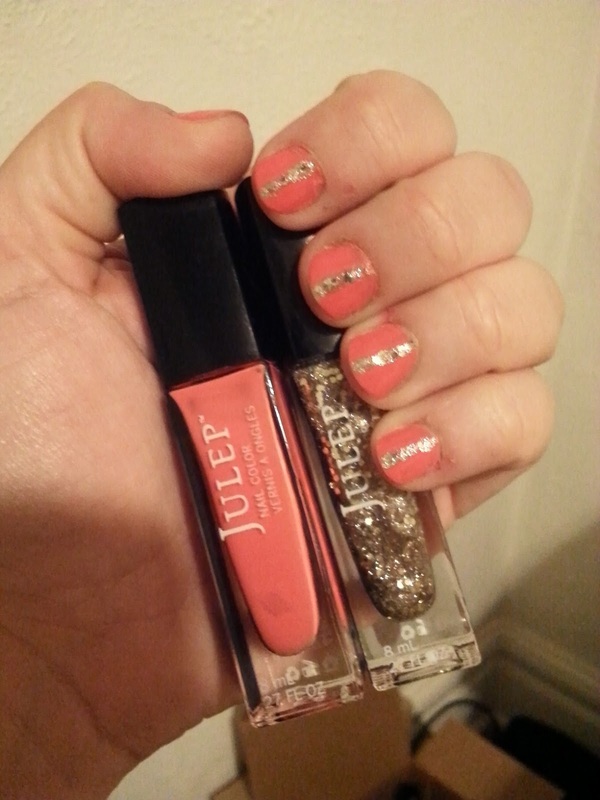 Julep Mavens receive many benefits such as product discounts, access to a secret store, and the ability to earn points for use towards future purchases. Use the code “FREEBOX” if you want to try it out. Julep Mystery Box: Hooray For May! Gnarly Gnails: Grab Bag Giveaway! !